Meinl CC16DATRC Classics Custom Dark Trash Crash 16"
CC16DATRC Classics Custom Dark Trash Crash 16"
Meinl CC14DATRC Classics Custom Dark Trash Crash 14"
Meinl CC18DATRC Classics Custom Dark Trash Crash 18"
Meinl CC16DATRCH Classics Custom Dark Trash China 16"
Meinl CC18DATRCH Classics Custom Dark Trash China 18"
The Meinl CC16DATRC Classics Custom Dark Trash Crash 16" is a dark trash crash cymbal with cut-outs, made of B10 bronze. The explosive response, followed by an extremely dry and short sound, is mainly caused by the precise cut-outs. This makes the Meinl cymbal ideal for fast and accentuated playing. Because of the wide sound spectrum and the sensitive response, the Meinl Classics Custom Dark Trash Crash 16" is not only suitable for rock, pop and fusion drummers, it can also hold its own perfectly in metal music. In addition, the exciting pattern sets optical accents that are unique. The professional high-tech manufacturing and computer-controlled processes guarantee consistently high quality and longevity. The Classics Custom Dark Cymbals owe their high quality standard to professional mechanical manufacturing. Computer-controlled high-tech processes guarantee consistently high quality. In addition, the use of high-quality B10 bronze provides an extraordinary basis for cymbal construction. 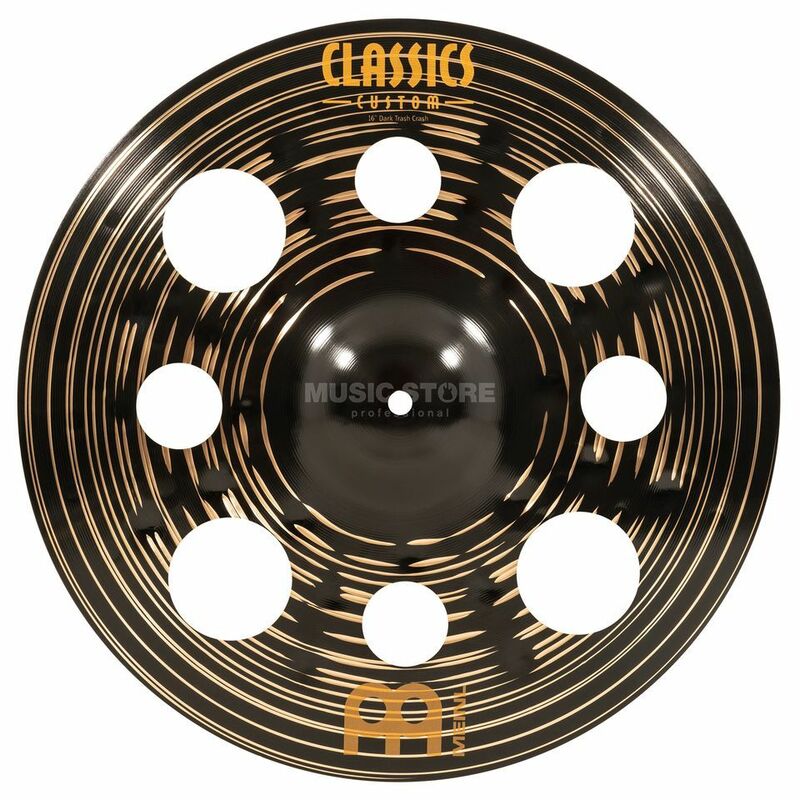 The wicked appearance of the Classics Custom Dark cymbals is based on the pattern, which immediately catches the eye due to the different colors of dark and metallic ring patterns. In addition to their unmistakable appearance, however, they also have audible advantages. The Classics Custom Dark cymbals have a particularly wide range of sound characteristics to offer. Deep, large hammer marks and the unique lathing process deliver the warm sound and at the same time a fast response with strong projection.